the foggy straight of San Juan de Fuca. time I proudly registered “Mr. and Mrs. But the race track idea persisted. Time and again our dear old friend Dr.
the right time in the person of Mr.
Now he is going ahead full speed. at full speed with that end in view. pect to come to Las Vegas some day. doors in heavy gold letters. quite a sensation in Vegas. The Al G.
prise from the standpoint of Las Vegas. had done each year when Mrs. J. T.
home on the West Side. the loving care she gives them. Exposition in 1893, for sugar content? region. Along in the 1860s Charles W.
fine vineyard at Indian Springs. were making considerable good wine. teresting tilings shown to newcomers. vines, uprooting and killing every one. land died about ten years ago. help to make this gay little magazine. piest Christmas you have ever enjoyed. with us this fabulous Las Vegas. —to all we wish . . .
at the Stewart Ranch. Mrs. Walter R.
of social life in the new town. gowns will live long in memory. a fort, the remains of which still stand. carrying the baby in the other arm. which we knew as Las Vegas Creek. from which to dip their water supply. necessity of a reservoir or of wells. merrily around in one of the springs. although we did bathe in the streams. tions, banquets and political meetings. was organized in the spring of 1923.
of them quite dignified social events. games were dignified and severe. ful music for the dancing. finally to a shady sort of a reputation. destroyed one night by fire. This clipping from the Ogden Standard Examiner July 17, 1931 reports on the building permit taken out by P. O. Silvagni for the Apache Hotel. 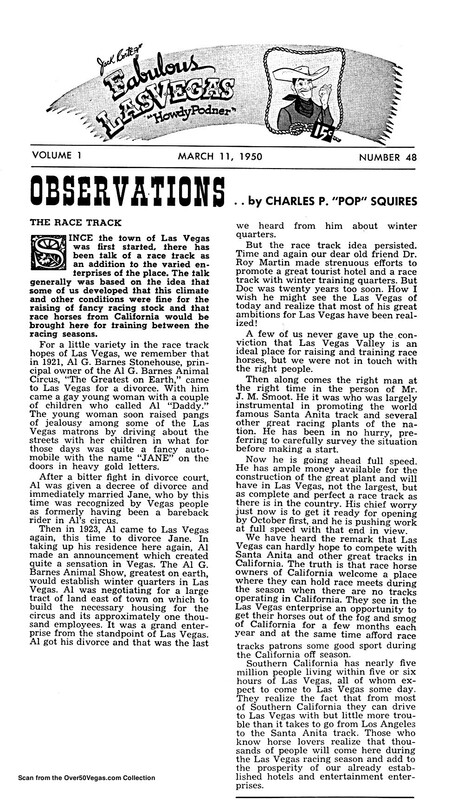 Pop Squires column below describes his recollections of that time in early downtown Las Vegas. the corner of Second and Fremont. lows growing in the bottom of the hole. fine hotel for Las Vegas. vator, but so it was. the building was leased to Mr. and Mrs.
willows grew out of the pools of water. might easily revert to the desert jungle. invested . . . and that’s for sure. Second wife: “You should complain! WE MIGHT HAVE MISSED YOU! "The Most Wanted Calendar of the Year"
Present This Coupon at Buckley's for Yours! the keyboard and pounded out a "hot"
hers in close natural harmony. as recording stars. The rest is history. ice and snow of her severe winters. half with Las Vegas as the county seat. became effective July 1, 1909.
in Las Vegas was Christmas of 1928.
dent Coolidge to make the bill a law. been hoping for so many years. blessing this community ever won. down on the Strip, Sunday evening. “Sands” for half an hour. congressman from California: W. B.
passed on to their reward. true when it was built about 1940.
true. But there it is speaking for itself. It was the pinnacle, we thought. his promise—it amazed all of us. it Sunday evening amazed all of us. great galaxy of Las Vegas resort hotels. ing little city in all the world! Seasons greetings from the Las Vegas Club. Christmas cheer from the Boulder club. piest and gayest season of the year. millions of discouraged human beings. would not be worth the living. religion of the Mormon Church. wisdom to preserve them for us. establish a Mission at Las Vegas. was a desperate fight for survival. Lake and President Wm. Bringhurst. also held in the evening. a few hours, returned without success. bear their sufferings with fortitude. had in Las Vegas was that of 1928.
later generation to build so well. they were for the benefit of mankind. building fences to protect their farms. gate of the fort enclosure in its place. Erastus Snow, arrived at the Mission. and had but little or no provisions. a great event in our history happened. And so Las Vegas was bom! of our most prominent citizens, Mr.
Traffic lights on the strip will make everything in Las Vegas the most fabulous in the world. bare and desolate piece of desert. of 1905 were strangers to each other. from the necessity of working together. perhaps a few feet of the garbage dump. phoid were breaking out here and there. We just had to do something. dare do otherwise, even if they wished. journed meeting. They were adopted. cost of carrying out the requirements. ment in Las Vegas we felt well pleased. their debts or saying goodbye. could do except exchange information. Board of Trade walked into the bank. had a Board of Trade. water, and the majestic scenery. from time to time as we needed it. then in the legislature early in 1909.
taxpayers, we got it through. You mean to say . . .
have gone by ! ! WE WHO HAVE KNOWN MIL­TON PRELL for the past sev­eral years as a kindly, friend­ly, yet very efficient gentle­man, must now change our es­timate and add the element of greatness to our appraisal of this gentleman's fine qualities. I have been among the many casual acquaintances of Mr. Prell since he bought the barny looking, half finished building which had been standing a long time just outside the city limits on the strip, its high, upward-expanding feature looking forlorn as it implored somebody to come and take pity. It did seem just too bad that so pleas­ant a man as Mr. Prell should get stuck with the unfinished, sprawling shack but, oh well! I suppose it's his own af­fair. So without protest or any attempt to save Mr. Prell from disaster by giv­ing him good advice, we just let him go his reckless way and spend his money as he pleased. Whatever happened, it was good money spent in Las Vegas anyhow! And so one day that upward expand­ing wedge-shaped thing that had been sorrowfully beckoning at the passers-by for a year or more blossomed into brilliance, with an operating "Bingo" card bingoing with lights once every minute and the attractively designed sign "Club Bingo." "Just a few years ago, desert! All of a sudden, BINGO!" And there it was, full of life and lights and activity—a lovely club, with fine foods and all the attractive fea­tures of a great Club, including the pleasant Bingo room and Mr. Prell pleasantly greeting his friends. Then, a year ago, a greater ambition was burning in the Prell heart. A new hotel was proposed for the site. Club Bingo was to be demolished and the new enterprise was to give us another great Strip hotel, excelled in size, beau­ty, novel design and beauty by no other hotel on our world-famous "Strip." with all his genius and energy give us anything more pleasant than the old '•Club Bingo"? Tuesday night we had our answer when "Hotel Sahara" had its opening. There is no use for me to try to describe it. Others have done that better than I possibly could do it. Besides if I really-tried to describe the new Sahara in any detail it would require several issues of Fabulous Las Vegas to contain it with­out any of the life saving advertise­ments Jack Cortez must depend upon to keep it going and growing. But I cannot resist the temptation to dwell very briefly on a few of the fea­tures that most pleased and impressed me. The first, and probably most im­portant feature of any similar enter­prise, is the friendly and kindly senti­ment of those who operate Hotel Sa­hara and are responsible for the pleas­ure of its guests. 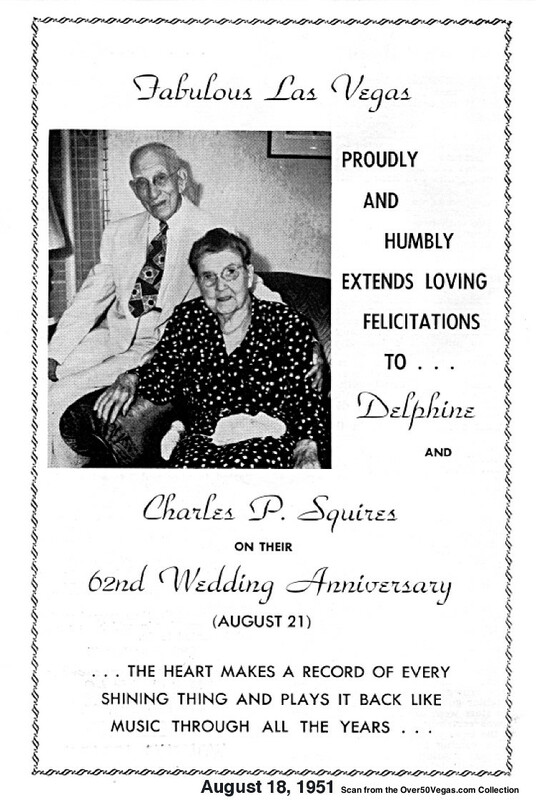 First of these in importance, so far as Delphine and I are concerned, is the clever Stan Irwin, director of entertain­ment, who put together for the opening a program which it would be difficult to excel on any occasion. Knowing that first nights, especially opening night celebrations, may easily be flops because of the worry and con­fusion of last moment preparations, we were delighted that Stan's presentations were just about the most pleasant and appropriate that could be chosen to adorn such an important occasion as Hotel Sahara's opening. Then—my, oh my! What am I letting myself in for! I will just subdue my en­thusiasm and let other pages of Jack's Fabulous Las Vegas tell you all about it better than I possibly could. From the creator and supreme manager, Milton Prell, down through all the stages of management and operation the results are great. And, instead of being compe­tition for the other great Strip hotels, the Sahara is an adjunct, bringing to Las Vegas more patronage for all. Las Vegas today is a greater and more prosperous city than she ever had been prior to Tuesday evening. And there goes the urge again! Did you ever see a more perfect miracle than the wide reaching green lawns about the great swimming pool, where just yesterday, it seems, was only the sand and dust of the desert? Sahara! We of Las Vegas salute you! A sentiment in which, I notice, Wilbur Clark and his Desert Inn and all the other great Strip hotels—El Rancho Vegas, which the genius of Tommy Hull and his sister Sally created some twelve years ago: Hotel Last Frontier, the Thunderbird, the Sands, the Flamingo (built on the forty acres of worthless desert Delphine and I owned for about twenty-five years) and all the down­town casinos and hotels heartily join!